Tag Archive | "Violet Goby"
The Dragon Goby (Gobioides broussonnetii) is a bizarre looking species that is also known to tropical fish keeping enthusiasts as the Violet Goby, Prehistoric Dragon Goby, Eel Goby, Peruvian Goby, and Dragon Fish. The Dragon Goby is widely distributed throughout the Southern United States, Central America, The Caribbean Islands and Northeastern South America. They have also been recorded in Mexico, Belize, Guyana, French Guyana, Venezuela, Colombia, Brazil, the Cayman Islands, Turks Caicos, Cuba, Haiti, Jamaica, the Dominican Republic and Puerto Rico. Dragon Gobies can be found in brackish estuarine areas where they congregate over muddy substrates. They are also frequently found in freshwater and in the open waters off estuaries. The Dragon Goby (Gobioides broussonnetii) has a long slender eel like body that is purple to lavender in color. They have a large head and a large mouth that they use to sift vegetable matter and small organisms from the muddy substrate. Although they grow to 25″ in their natural habitat, aquarium specimens are usually smaller. There are no visible differences between the sexes. Despite their large size and specialized feeding requirements, the Dragon Goby’s bizarre appearance has made it popular with tropical fish keeping enthusiasts. Unfortunately they do not survive long in freshwater. Gobioides peruanus is a smaller, true freshwater riverine species that grows to only 18″ in their natural habitat and is often sold as Gobioides broussonnetti. Although they look similar, Gobioides peruanus is thicker and has a more purple colored body. 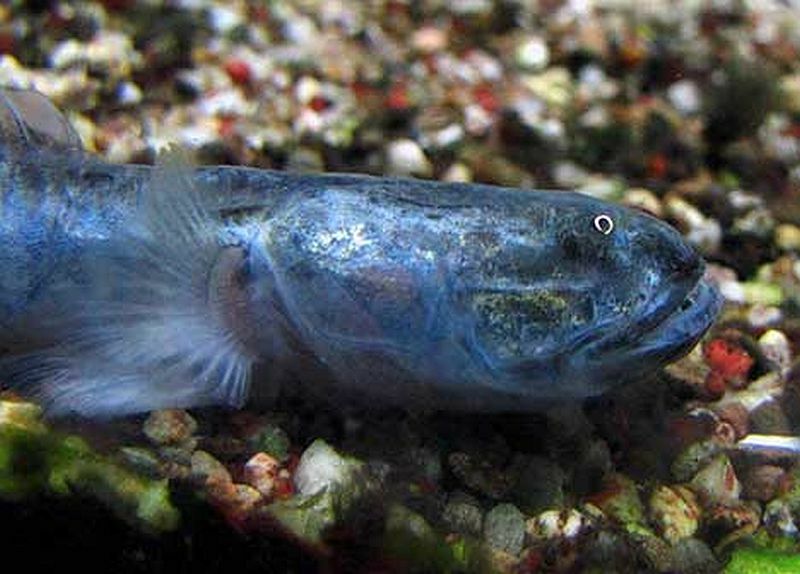 The true Dragon Goby, or Violet Gogy (Gobioides broussonnetii) is totally unsuitable for a general community aquarium. However they can be kept with other peaceful brackish water species. They are territorial with their own kind, but peaceful in nature and will not eat even the smallest tank mate. They should not be housed with any aggressive brackish water species that out compete them for food and when keeping a group of several Dragon Gobies, a very large tank is needed to minimize bullying. The Dragon Goby is a timid, burrowing species that is best kept in a 55 gallon or larger aquarium with a soft aragonite sand substrate that is several inches deep, and plenty of smooth rocks, caves, bogwood and plants for them to hide among. They need hard brackish water that is at least a quarter of the strength of marine water preferably between (1.005-1.015 sg) with a pH of 7.5 to 9.0, an alkalinity of 10-25 dKH, and a temperature range of 73-79°F. They enjoy spending their time partially buried in the substrate. Although there are no external differences between sexes,the Dragon Goby can be bred in an aquarium environment. Small spawning harems of one male to 3 or more females is recommended and the male will spawn with several females over the course of a day. After spawning, the females should be removed from the tank and the male will continue to guard the eggs until they hatch, usually within 36 to 48 hours. After hatching, the male should also be removed from the tank. The fry can be fed green water and rotifers after they absorb their egg sacs, and after a month or so, they will be able to eat freshly hatched baby brine shrimp. The Dragon Goby is a scavenger that in their natural habitat, feed on detritus and filamentous algae by filtering them from the mud with their mouths. In an aquarium environment, most specimens will adapt to eating a varied diet of live and frozen bloodworms, brine shrimp, tubifex, pieces of algae wafers, Spirulina , nori, etc. However, feeding freshly imported specimens can be a problem. Vegetable matter is essential to the well being of these fish. Both Gobioides broussonnetii and Gobioides peruanus are sold in tropical fish keeping shops as Dragon Gobies, Peruvian Gobies or Violet Gobies. Make sure your supplier knows the difference between species before purchasing one for your tank. Both are commonly available when they are between 4″ and 6″ in length.